Preview courtesy of De La Salle assistant coach, Tony Roberts. 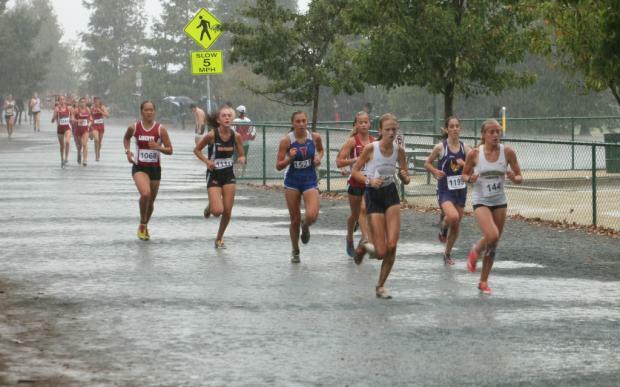 On Saturday, September 15th De La Salle High School is proud to once again host the De La Salle Nike Invitational (photo above from a few years ago when California had rain in the fall). We at De La Salle are confident we will once again produce an exciting meet with competitive races throughout the day. We have over 300 medals and over 200 pieces of Nike merchandise waiting to be claimed by Saturday's top competitors! Boys Individuals to watch: A highly-talented boys' field will be toeing the line this Saturday in Concord. Current State 3200-meter champion Matt Strangio (Jesuit) will be coming in as the favorite in this heated race. Strangio should have his hands full dealing with CIF 3200m 6th place finisher Connor Livingston (De La Salle), who will have the home turf advantage. Another notable challenger is Preston Norris (Las Lomas). Norris is coming off of a victory from last weekend's Lowell Invitational and a course record at the Monte Vista Invitational. Damian King (Bella Vista) was second two weeks ago only to Strangio, look for King to once again be battling it out up front with this great field. Boys Team to watch: Last year the Granada boys came away with the team title and those coveted Nike backpacks; no surprise this year they are again a favorite. Jesuit, however, might just be the team to spoil the Granada's repeat victory party. Also, keep an eye out for the purple jersey of Amador Valley and the blue jerseys of Campolindo as both teams have also earned Northern California top-10 rankings. Girls Individual to watch: Last weekend Rayna Stanziano (Concord) came away with a strong victory at the Ed Sias Invitational. She will be a favorite this weekend as she takes the "long" trip over to Newhall Park. Kate Tavella (San Ramon Valley) was the fastest time at last week's Monte Vista Invite. Tavella should not be alone challenging for the first-place spot, look for Gabriela Hernandez (Vacaville) and Kelli Wilson (Monte Vista) to also be in contention. Girls Team to watch: The Granada girls are coming off of last weekend victory at the Lowell Invitational with a score of only 30 points. They were the big winners last year at the De Le Salle invite and they look to add more hardware this weekend. League rivals San Ramon Valley, Monte Vista, and Amador Valley will keep Granada honest. Campolindo's girls' team can never be counted out either in the chase for the victors' Nike backpacks. Have we missed anyone? Probably. Will there be any upsets? Almost certainly. Are we excited for another fun and competitive meet? Definitely! We wish you the best racing experience at this year De La Salle Invitational. The course records for this meet can be found at this LINK. You can also check out a preview of the course that was done by Kevin Selby at this LINK. We also have a video of the course courtesy of Jesuit HS coach, Walt Lange. A link to the live results will be posted once it's live. A list of the 39 schools competing at the meet are posted on the next page.